Enrich Intelligences. Get a Headstart! Worried whether your child's full potential is being explored and developed at the pre-school? Unable to understand why they do what they do? Your child is throwing lots of emotional tantrums at home/school? Sleepless nights? NLP (Neuro Linguistic Programming) and Multiple Intelligences (Howard Gardner's Framework). 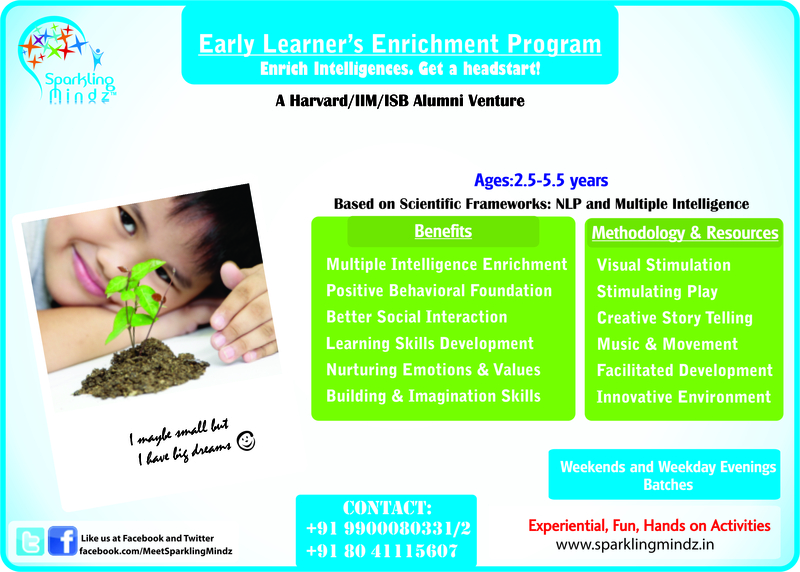 The intent is to develop the child's innate intelligence and potential. The program is conducted using activity-based methodology based on various creative methods to stimulate the child's brain in the different intelligence domains. The program makes your child confident in his abilities, comfortable in social interactions and more adaptable to change in situations and with people around him/her. It will enable you, as the parent to understand, appreciate and work with the child in a more effective manner to develop their skills. The program is delivered for 2 hours/week on weekday evenings/weekends.